Which Materials Are Best for Front & Back Doors? When considering replacing your front and back door, it can be challenging to find the design you want which also provides the functionality you require for your home. One of the main factors to consider is which material is best for your new doors with a variety of options available. To simplify your decision, we’ve broken down some of the leading products on offer, exploring some of the benefits and drawbacks of each door material. Timber doors are still popular in some homes, especially for those in period properties who want a door which perfectly matches the existing features of their home. Homeowners love the beautiful, authentic appearance wood provides for their entrance-ways, but there are downsides to the material. One of the main disadvantages is the high level of upkeep required to maintain its quality. While modern timber doors have been made to resist warping and bowing, they may need re-painting or staining over time or be treated for protection against rot. This can be time-consuming and costly over the years, so if you’re not desperate for a wooden door, there are some other solutions available. Composite doors provide the ideal solution if you’re looking for the look and feel of a wooden door, yet want the functionality and low upkeep which comes with modern products. Made from a mixture of materials, they usually encompass a strong PVC frame and a combination of hardwood and polyurethane for their robust foam core. They come in a range of designs, including heritage styles, contemporary looks and decorative glass features. However, it’s important to find a specialist who can supply and install these quality products to the highest of standards in order to create the effect you want. If looking for clean, modern looking designs which can fit in with a range of property styles, uPVC is a great option. This low maintenance material has the benefit of energy efficient glazing, as well as being incredibly durable and weather resistant. These windows require minimal upkeep too – just wipe clean to maintain. A top manufacturer of uPVC doors is Kömmerling, one of the most secure door collections on the market which has been quality approved by the British Board of Agrément. UPVC offers exceptional value when it comes to front and back doors, providing a good choice for those who aren’t opting for a wooden design. Are you looking to replace your front or back door? 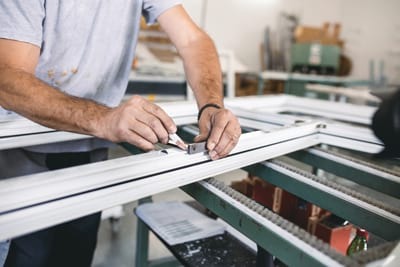 Here at Merton Windows, our experienced team has an extensive selection of products for you to choose from. We operate a ‘no hard sell’ policy, so you can take the time to look at our product line without any pressure to commit. Our experts can also talk you through any further information you require about each material, helping you identify the best product for your needs. Covering Surrey and London areas (including Raynes Park, Shepherd’s Bush and Ewell), contact our friendly team for a chat.